<strong>HIGH SEASON:</strong> Left fielder and Santa Barbara High alum Connor McManigal (above) connects on one of his four hits against Napa College in the Vaqueros’ season opener last Friday, January 30. SBCC’s number one pitcher Justin Bruce (left) helps take the team to a 16-13 victory over Napa College. The calendar says spring is six weeks away, but you wouldn’t know it from the flowering trees and the activity on college baseball diamonds. Westmont College has already played nine ball games. 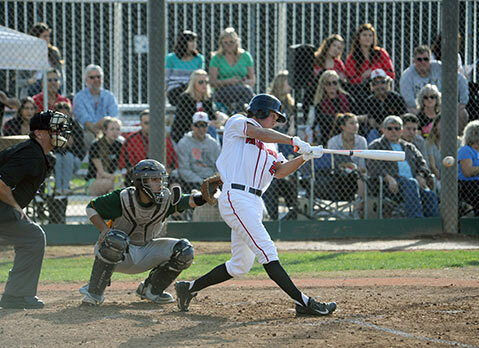 Santa Barbara City College got its season underway with a three-game series last weekend. UCSB is gearing up for its season opener next week. In parts of the country that are deep in winter snowfall, baseball fans keep up with the sport at “hot stove” gatherings. Santa Barbara has one of those, too. FORESTERS GABFEST: Ryan Spilborghs, who graduated from the Colorado Rockies’ outfield to the club’s broadcast booth, will be the guest speaker at the Santa Barbara Foresters’ annual Hot Stove Banquet on Sunday, February 8, at the Earl Warren Showgrounds. Spilborghs was a standout at Santa Barbara High and UCSB, and he played summer ball with the Foresters before moving on to the pros. He became a charter member of the Foresters Hall of Fame in 2010. Three new members will be inducted Sunday: Virgil Vasquez, another former S.B. Don and Gaucho, who pitched for the Detroit Tigers and Minnesota Twins; Mike Pearl, a longtime community supporter of the Foresters; and Neil Medchill, who took a significant page out of Forester manager Bill Pintard’s playbook. Besides turning out one of the most successful amateur teams in the country ― the Foresters won their fifth National Baseball Congress World Series title last summer ― Pintard connects his players with children suffering from cancer and other grave diseases. Medchill, an outfielder with Santa Barbara’s 2008 champions, was playing last summer for the Sugar Land (Texas) Skeeters, an independent pro team, when he put his career on hold to donate life-saving bone marrow to a complete stranger. “It’s an unbelievable story,” Pintard said. Besides hearing all about it, baseball fans attending the banquet, starting at 6 p.m., will be able to sign up for a bone-marrow registry. Ticket prices in advance are $75 for adults and $20 for students 18 and under. At the door, prices will increase by $20. Visit sbforesters.org. THROWING HEAT: UCSB staged an intrasquad game last Friday, and when junior right-hander Dillon Tate began his four-inning stint on the mound, a dozen major-league scouts swarmed behind the backstop with radar guns drawn. They looked like a SWAT squad. Tate’s fastball was clocked at 95-96 mph. He was a lights-out closer last year, and Gaucho coach Andrew Checketts is looking to put him into the starting rotation. Also getting the scouts’ attention was lefty Justin Jacome, a tall junior with good command. Tate has been tabbed as a Preseason All-American by three publications: Baseball America, Collegiate Baseball, and Perfect Game. UCSB has been placed in early top-20 rankings, and Perfect Game predicted the Gauchos would win the Big West Conference, one of the nation’s strongest baseball leagues. The Gauchos will play 12 of their first 13 games on the home diamond at Caesar Uyesaka Stadium, starting with BYU on Friday, February 13. THE NEW AD: The overall leadership of UCSB’s sports teams has been strengthened by the hiring of John McCutcheon as the Gauchos’ director of intercollegiate athletics. McCutcheon, who will take over on March 2, improved the stature of the athletic programs at both Cal Poly and the University of Massachusetts. His 12 years at Cal Poly (1992-2004) included a $25 million capital campaign for athletic facilities, including the construction of a lighted 1,734-seat baseball stadium. It was expanded to a capacity of 3,000 with bleachers when the Mustangs hosted a 2014 NCAA Regional ― something UCSB would be unable to do in the present condition of Uyesaka Stadium. “He’s an experienced administrator who accomplished a lot of things,” said Checketts, who was among the Gaucho coaches vetting the AD candidates. “I think he’ll do a good job.” McCutcheon oversaw many new projects during 11 years at UMass. The Minutemen made their first appearance in the NCAA basketball tournament in 16 years and also produced academically accomplished athletes, a priority at UCSB. 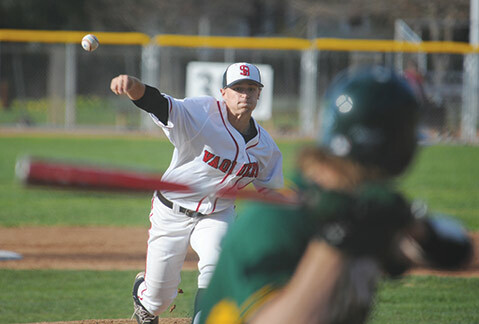 SWEEPS WEEK: Coming off their highest finish (fifth place) in the California community college play-offs last year, the SBCC Vaqueros enter the 2015 baseball season with high hopes. Their pitching staff has three Division I recruits ― Lucas Jacobsen (Long Beach State), Sean Barry (San Diego), and closer Kit Larson (N.C. State) ― as well as their No. 1 returning starter, Justin Bruce. Coach Jeff Walker has put them in the middle of the batting order. McManigal went 4-for-5 in SBCC’s opener last Friday, a 16-3 victory over Napa College. The Vaqueros shut out Napa 4-0 in the first game of a Saturday double-header, and Brakka finished off a sweep in the nightcap. With two out in the bottom of the ninth and runners at the corners, Brakka hit a slow roller toward third that resulted in a wild throw and the final run of a 4-3 comeback win. That sent the Vaqueros storming onto the field, something that could happen with frequency at Pershing Park this year. Westmont College also swept a three-game series against visiting San Diego Christian. Coach Robert Ruiz’s Warriors are 7-2 overall and 4-2 in the Golden State Athletic Conference. NAIA All-America hurler Russell Harmening raised his record to 2-0 in the opener, a 9-3 Westmont victory. The Saturday scores were 11-4 and 3-2, with former UCSB pitcher Andrew Vasquez notching a win in the latter game. ON THE BRINK: The losses continue to pile up on the UCSB women’s basketball team, but one could say the Gauchos are 0-19-1 instead of 0-20. They tied UC Davis on Onome Jemerigbe’s clutch three-pointer at the end of regulation time Saturday. It seemed they were in position to get a “W,” like the Seattle Seahawks on the one-yard line at the Super Bowl. But then they turned the ball over, and the Aggies won in overtime, 60-54. UCSB’s preceding defeats were by four and three points. The players continue to try hard, and I do believe that they will win a game or two in the second round of the Big West play.